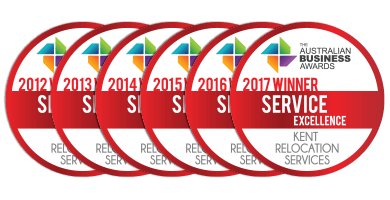 Kent Relocation Services Recognised for Service Excellence for the Fourth Year in a Row. 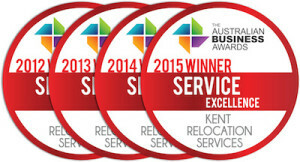 Kent Relocation Services has been awarded the 2015 Australian Business Award for Service Excellence, marking the fourth consecutive year in which Kent’s corporate relocations business has maintained, and improved upon, its reputation for exceptional customer service. Over the past 12 months, Kent Relocation Services has focused on transforming into a truly client centric organisation, leveraging clients’ thinking to unlock further value within the Kent team. With corporate clients of all sizes spread across all sectors, we are concentrating on how we can make our clients’ businesses run more efficiently, and their systems and structures simpler. We are partnering with our clients to navigate an ever changing, competitive marketplace. “Kent Relocation Services ensures that all clients leverage unique cost savings and receive best practice customer service, particularly with our new focus on vertical service integration solutions. The impacts of these solutions transcend normal service expectations. We are creating partnerships tailored to a specific ‘improvement’ agenda for each client,” said Mr Irwin. A one-stop online global information resource for assignees, which is akin to a moving home version of the Lonely Planet guides. A national property management team that provides expert services for staff housing. This option has proved drastically cheaper for clients previously using serviced apartments and hotels. A Kent-owned furniture hire service that has reduced our clients’ furniture hire costs by as much as 9%.